We’re discussing some refactoring before releasing a cfpayment 1.0 and one of the things I’m working on is figuring out when to use ColdFusion’s in-built error handling and when to use HTTP status codes. Currently we use the throwonerror option for CFHTTP which results in issues like 404 throwing an exception. This works but as more and more services expose RESTful APIs which use status codes other than 200 to communicate results, this is not perfect. 411 Returned normally with status Connection Failure. Status code unavailable. 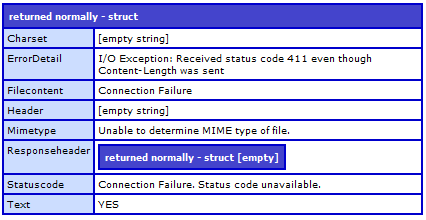 Notice Status Code 411 doesn’t return a numerical status code but rather a string “Connection Failure. Status code unavailable.” The FileContent is set to “Connection Failure” while all other status codes are left blank (assuming that the request doesn’t return any data, as my test script does). Good to know. In summary, using throwonerror=no looks reasonably safe but you still must account for the catch-all COM.Allaire.ColdFusion.HTTPFailure. My battle-tested code (which has processed more than $15MM) suggests you also need to check for coldfusion.runtime.RequestTimedOutException which is a different kind of exception when CFHTTP times out or the page times out.